Canadians are unsure bombing will work, hesitant about sending troops, and think a ground war may be needed. 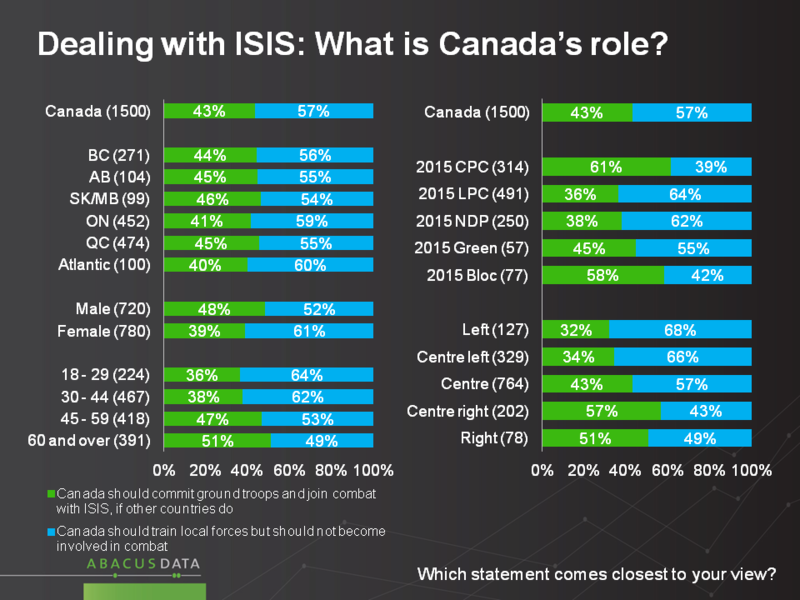 In our most recent nationwide public opinion survey, we explored three questions that tapped into how Canadians feel about the choices facing Canada and other countries when it comes to dealing with ISIS (This data was gathered after the attacks in Paris, but before the shootings in San Bernardino). 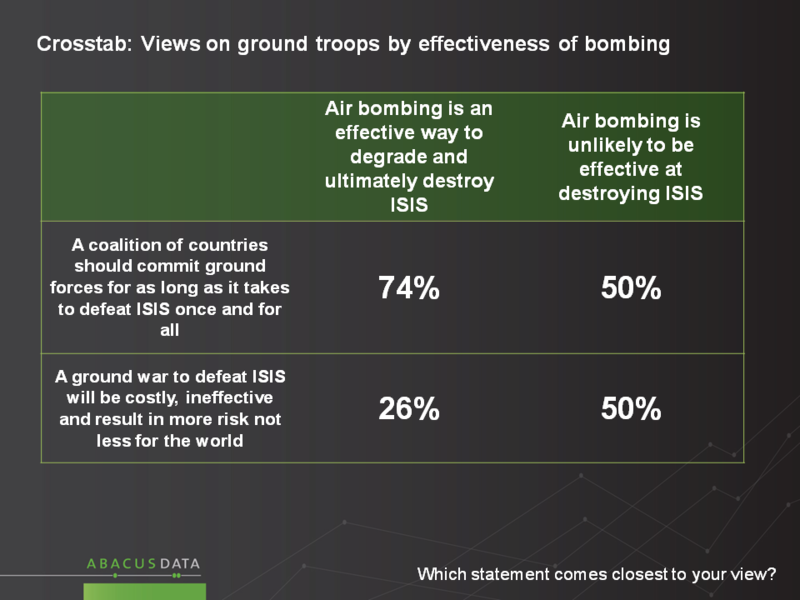 Under half (45%) of those surveyed said they believe “air bombing is an effective way to degrade and ultimately destroy ISIS”, while a majority felt “air bombing is unlikely to be effective at destroying ISIS”. These views vary somewhat by partisan affiliation – but the differences might not be as large as one might expect. As many as 42% of Liberal voters think bombing would work, and as many as 44% of Conservative voters doubt that it would. 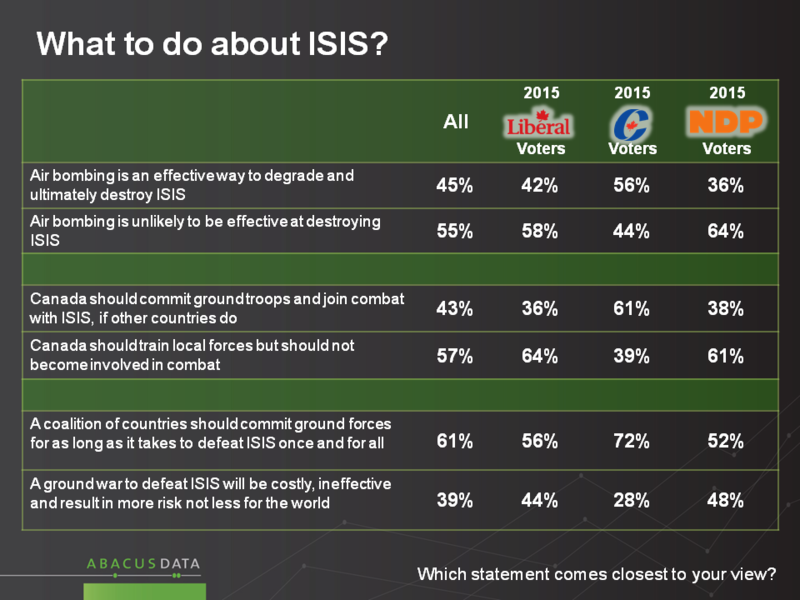 NDP voters are the most certain on this question, with 64% saying bombing won’t work, and 36% saying it will. There is less variation by demographics or region. Men, and those 45 and over are somewhat more likely to think that air bombing is effective while women and those under 45 are somewhat less convinced. Should Canada Send Ground Troops or Train Local Forces? The uncertainty about whether air bombing would work is also evident on the question of whether Canada should send ground troops to join in combat with ISIS, if other countries do. Almost half (43%) think we should, while the majority (57%) prefer that “Canada should train local forces but not become involved in combat”. Once again, differences by partisanship are evident but not extreme. Majorities of Liberal voters (64%) and NDP voters (62%) say we should stick to training local forces, while 61% of Conservative voters favour participation in a coalition ground war. Similar demographic differences persist on this question as well. Should a Coalition Commit to a Ground War to Defeat ISIS? 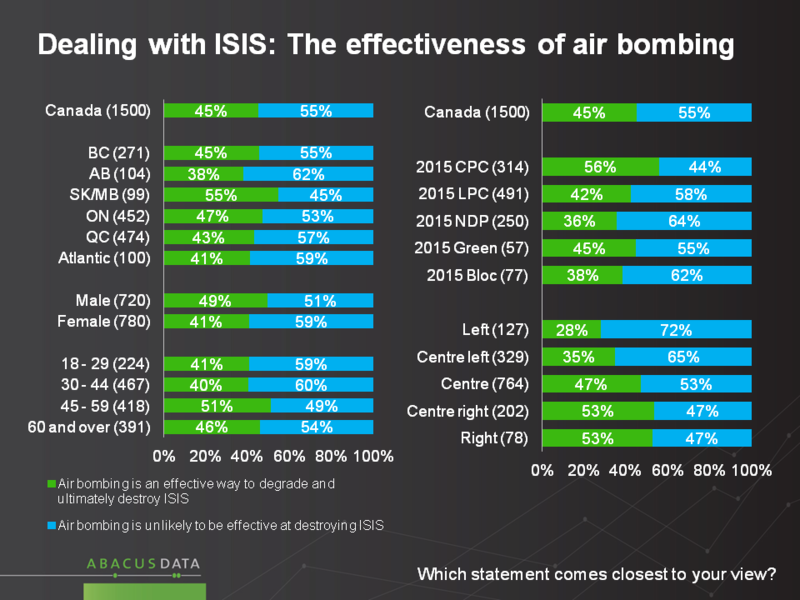 While many have doubts about bombing’s effectiveness and hesitate about having Canadian troops be involved in combat, when asked if a coalition of countries should commit to a ground war, the tendency is for most people to want to see that happen: 61% say “a coalition of countries should commit ground forces for as long as it takes to defeat ISIS once and for all” while 39% felt “a ground war to defeat ISIS will be costly, ineffective and result in more risk, not less, for the world”. Conservative voters (72%) are most convinced of the merits of a ground war, but significant numbers of Liberal voters (56%) and NDP voters (52%) share the feeling that this might be necessary. Older Canadians and men are more likely to favour a coalition ground effort than women and younger people. Worth noting is the fact that three quarters (74%) of those who think air bombing would be effective also believe that ground forces are needed. Of those who doubt the effectiveness of an air campaign, half thing ground troops are a good idea. 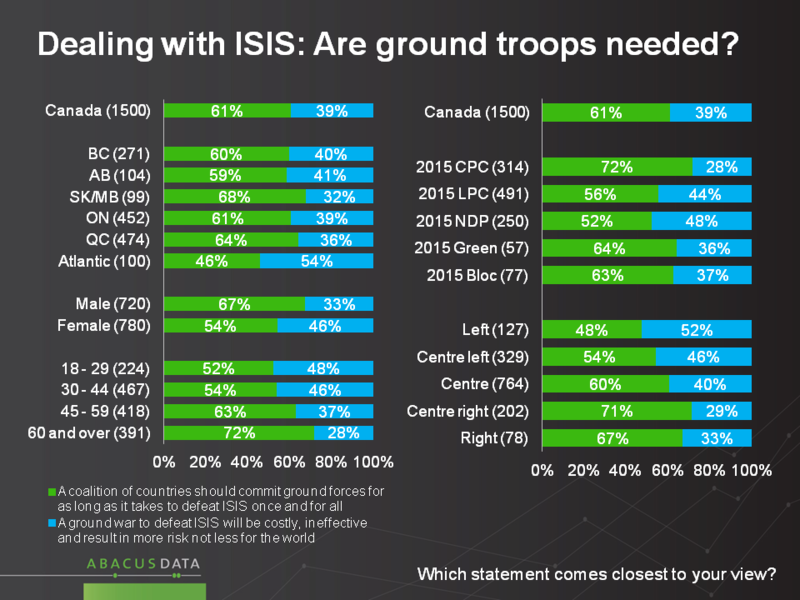 These numbers illustrate that many Canadians are unsure of what course will be best for Canada and the world when it comes to dealing with the complex threat posed by ISIS. According to Bruce Anderson “In a situation like this, Canadians know that their political leaders have no simple, easy or obvious choices. They also know that the situation is evolving and that new events or information may tilt the balance in favour of one type of action or another. Our survey was conducted online with 1,500 Canadians aged 18 and over from November 23 to November 25, 2015. A random sample of panelists was invited to complete the survey from a large representative panel of over 500,000 Canadians, recruited and managed by Research Now, one of the world’s leading provider of online research samples. The Marketing Research and Intelligence Association policy limits statements about margins of sampling error for most online surveys. The margin of error for a comparable probability-based random sample of the same size is +/- 2.6%, 19 times out of 20. The data were weighted according to census data to ensure that the sample matched Canada’s population according to age, gender, educational attainment, and region. Totals may not add up to 100 due to rounding.